FOLLETT SOFTWARE is the world’s leading library automation software, installed in over 40,000 libraries worldwide. Each of Follett’s modules can be acquired separately, making an easy transition to automation with a minimal budget and a step-by-step approach. It includes a fully integrated database accessible from the different modules and which may be searched over the internet, and all data entered are compliant with MARC 21, the standard data format for libraries. One-person libraries to whole universities use Follett to efficiently manage their collections and library transactions. DESTINY is Follett Software top-of-the-line library automation software. It is a completely web-based software, with all functions like OPAC, cataloging, circulation, inventory, reports, and others requiring no more than a web browser. It is suited for multiple campuses and consortia where only one server is required. It may also be used in single-campus libraries, lowering the total cost of ownership. It has the right information and resources at the right time, maximizing your library’s power to support students and teachers,curriculum and instruction. INMAGIC information management software organize and deliver enterprise content, seamlessly integrate internal and external content sources and deploy business-critical information to corporate portals, intranets, extranets and the Web. Applications include content management, competitive intelligence, library, archives and records management, litigation support and knowledge management. Inmagic products are known for their flexibility, ease of use and deployment, and minimal need for IT support. Inmagic solutions make the difficult easy for corporate content managers. WEBCLARITY SOFTWARE INC. is a market leader in information search and retrieval tools and services for librarians, catalogers, researchers, and students. WebClarity offers a suite of products utilizing the powerful Z39.50 standard, including , a market leading bibliographic search client for Windows, , a web-based copy cataloging resource, and Resource Gateway, a customizable web based portal for publishing multiple information resources. WebClarity also e-publishes The Resource Registry, the definitive on-line directory of Z39.50 databases and LibJobs, a popular online job board for the library industry. BARCODE READERS enable data capture for encoding of books and patrons, for circulation transactions, and for inventory. We provide a range of choices including CCD, laser and portable barcode readers. TRANSACTION TRACKER are small printers used to make a written record of your patrons’ loans, returns, fines and payments. Our receipt printers are optimized for Follett circulation software and use thermal paper. 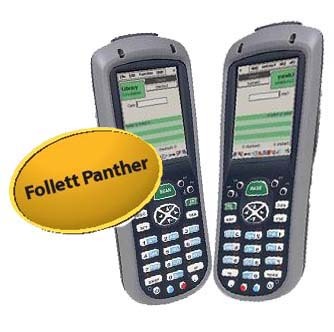 The FOLLETT PHD Panther’s ease of use and ergonomic design enable anyone to circulate books or take inventory from anywhere. Superior storage combined with convenient PDA functionality makes the Panther a must-have for any library. Panther also contains an internal pop-up keyboard and external stylus for easy data entry. WIRELESS NETWORK access points and interface cards ensure that your library’s interior is not defaced by LAN wiring while allowing you to relocate workstations easily. Our wireless network products are field-tested, easy to configure and can handle the load of the largest libraries. BARCODING SUPPLIES delivered right to your library ensure continuous processing of your new acquisitions. Barcode labels that come in various sizes and printed according to your specifications, are our best sellers not only because of their quality but also due to our lower prices. Barcode protectors are transparent stickers used to cover your barcode labels. We supply quality barcode protectors appropriate to the label you ordered, at our usual low price. Blank label sheets as well as barcode printer ribbons are also available for those who print their own barcodes. Thermal paper for receipt printers are indispensible for those who provide receipts to their patrons. Make sure you stock on these essential supplies to ensure continuous service at your circulation desks.